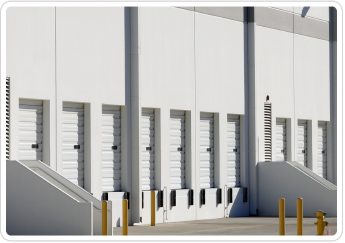 A commercial garage door provides your fleet vehicles with access to and from your place of business. Now that you have the right door, you have peace of mind about the security of your company cars and the building itself. However, our service to you doesn't end when we sell and install your garage door. We know that at some point your door will probably become faulty due to regular use. Additionally, individual components such as springs, cables, rollers, hinges, and cables may wear down at different times, but they all have to be in good condition for your overhead door to operate effectively. Because the condition of your commercial overhead door can affect your income, we act fast when you request commercial garage door repair in Frisco, TX. Our technicians at Discount Garage Door Repair are knowledgeable about all kinds of garage door repairs, so we will fix your door's problem. Strange sounds coming from it and slow responses when you raise and lower it are indications that something is wrong with your commercial garage door. If you disregard the issue too long, it could end up costing you a lot of money. Be proactive in the care of your business' overhead door by calling us for services. We'll come to your location and thoroughly inspect your garage door. If we find a problem, we'll explain it to you and give you our recommendation about how to fix it. At your request, we'll make the repairs as quickly as possible so that you and your employees aren't inconvenienced for too long. We only fix what's necessary to restore your overhead door's operation. Sometimes a residential garage door has damage that's so severe that it requires garage door replacement. The same thing is possible for a commercial garage door. If too many of the door's components are broken, it may not be worth it to have it repaired. We tell you upfront if that is the case, and then we'll help you choose products that are ideal for garage door replacement. Remember, you want a door that is sturdy, weather-resistant, and easy to use. We sell and specialize in the installation of replacement commercial garage doors from top brands that include Sears, Wayne Dalton, Amarr, Clopay, and many others. These high-quality doors are designed to provide you with years of service when used properly. Contact us for commercial garage door repair that eliminates the need for door replacement. We proudly serve Frisco, Plano, Mckinney, The Colony, Prosper, Aubrey, Lewisville, Little Elm, and Allen, TX and the surrounding areas.